Tiger in the Jungle is coming along nicely, but not enough progress to warrant a pic at this point. As I’m working at it, I already know what my next picture will be. 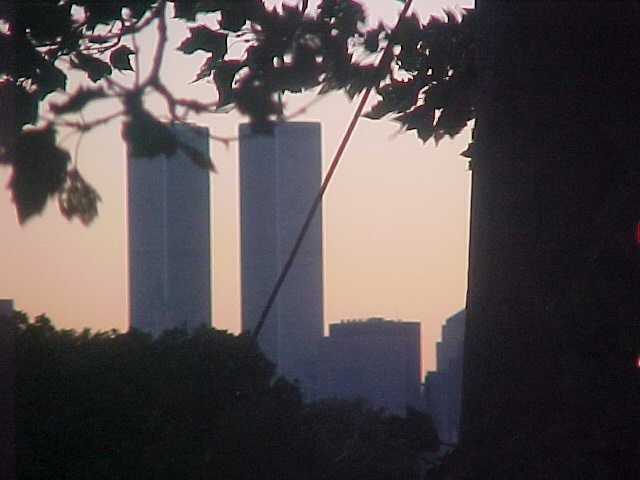 The anniversary of September 11 just passed. I wanted last spring to do something healing for the people affected by it, by drawing the new Freedom Tower. However, looking at my FB page, I realized many people, especially in the NYC area, are still processing the trauma. So, for them, I’m doing a picture based on this photo my boyfriend took many years ago from our picture window. I remember the smoke rising from the empty area in the sky where this view used to be, and the smell of burning plastic wafting across the river. So, here’s the photo reference, for September 10.